Bit O Honey Candy - 6 Bars. Bit O Honey makes the perfect 50's party favors. Each bar has 6 pieces of chewy honey flavored taffy with almond bits separated with a wax paper wrapper. 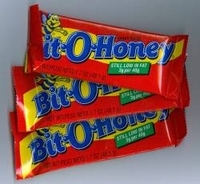 If you need more 6 bars, no problem we sell these Bit o Honey bars in a 36 count box. For more old time candy favorites like these check out our Nostalgic Candy section for more great treats.